Welcome home to Chautauqua! What a joy it is for me to greet you as we begin the 144th convening on these sacred grounds and my first as your 18th president. It is also a great deal of fun, as I haven’t appeared in print in the Daily for about two decades! 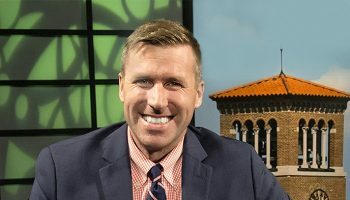 I started my Chautauqua journey as a member of this newspaper staff, immediately out of undergraduate studies at St. Bonaventure University, and had a chance to serve as a guest critic for several years after graduate school. Having the chance to pen this welcome as your new president surpasses any previous assignment. This is a momentous season for Chautauqua. 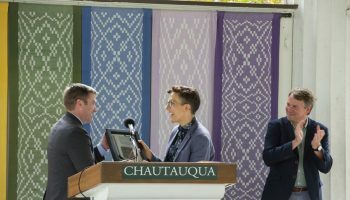 We start our journey with a new Amphitheater, a new contract with the Chautauqua Symphony Orchestra and just having successfully completed the Promise Campaign, bringing more than $103 million of new investments to Chautauqua. My heartfelt thanks to all who helped make these dreams a reality. 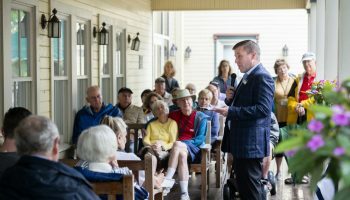 Week One at Chautauqua is an exploration of “Invention.” One of the things I most love about Chautauqua is its ability, through you, to ask probing questions about society. This week we will examine not only the great moments and conditions under which invention and ingenuity thrived in the world, but we’ll more deeply probe what conditions need to exist for inventions to thrive. And we’ll learn together what great next leaps may be just around the corner. While those more secular pursuits are interesting in their own right, we’ll also look at how various faith traditions answer the question about where God, through many names, lives in the notion of invention and how religion has shaped our notion of the divine. We gather at Chautauqua at an interesting time in the life of our nation. I’m sure you show up here having left a community that is struggling with the polarization of our politics and with deep questions about the future of our nation. No matter where you join us from, I extend an invitation to mirror and model a different way of being in community with one another. Chautauqua is equal parts convener and catalyst. A pastoral setting encourages the body to slow down and the mind to open, allowing the provocative questions that arise from intellectually stimulating discussions to be heard in the stillness. A palpable sense of the spiritual encourages reflection. And a community residing in close proximity inspires the ongoing conversation that lets in the light and most often leads to fresh insight. With minds opened to new ideas and opinions tempered through respectful dialogue, the seemingly implacable can shift. Civility is a muscle like any other that strengthens when exercised. So let’s begin as we start a new season. Take in all you’re experiencing, ask tough questions, engage in dialogue, but also open yourself up to an experience of other ways of thinking and other perspectives. My greatest hope for our season is that we might find a way to demonstrate that people of diverse backgrounds can come together and engage in a way that lifts up, rather than tears down, difference. 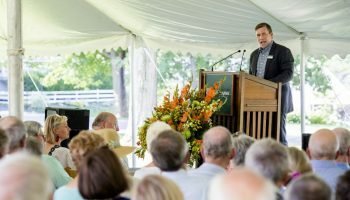 And when we’re not engaging in thought-provoking lectures and faith-filled reflections by our visiting preachers, immerse yourself in the bountiful array of visual and performing arts activities, as well as the many avenues Chautauqua provides for recreation and relaxation. Thank you to the many Chautauquans who have gone out of their way to make my first six months on the job such a welcoming experience. I look forward to seeing you all on the grounds this week and greeting you on your porches, on Bestor Plaza or down by the lake. Until then, welcome home to Chautauqua — whether this is your first visit or you’ve lost count of how many times you’ve come here. From the second you step foot on these grounds, you are a Chautauquan.